What is a Map Unit Anyway? Once students learn the basics of meiosis and how alleles can swap places during prophase one (crossing-over), they are ready to learn how frequency of crossover provides clues to the location of alleles on a chromosome. Chromosome maps illustrate how far alleles are on a chromosome using a MAP UNIT. Map units are based on the frequency of cross-over between the alleles. In short, the farther apart the alleles are on the chromosome, the more likely they will cross over, or switch positions. 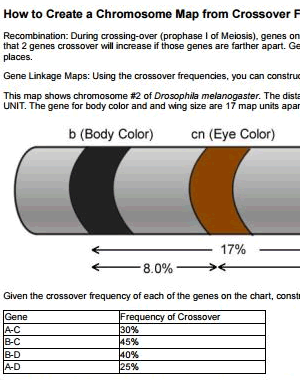 This is a difficult concept for many students to visualize, this worksheet can help them work out a chromosome map. It includes a simple walk-through and several sample problems. HS-LS3-2 Make and defend a claim based on evidence that inheritable genetic variations may result from: (1) new genetic combinations through meiosis, (2) viable errors occurring during replication, and/or (3) mutations caused by environmental factors.